Save money on tickets for your favorite productions! The Central Arts Card offers excellent discounts to the performances you want to see. Receive up to $5 off each ticket, up to 4 tickets, for select performances at Mitchell Hall Theatre, the UCO Jazz Lab, the ACM@UCO Performance Lab and the CHK|Central Boathouse. Plus, patrons will receive discounts at participating local businesses. 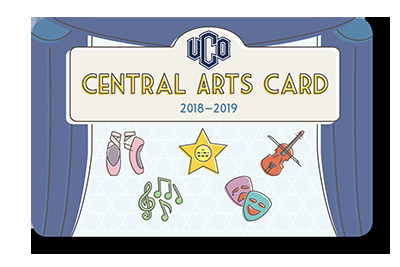 The Central Arts Card is available through June 2019 for patrons, parents, alumni, sponsors and all other lovers of the arts for the low price of $20. All proceeds benefit critical needs of the UCO College of Fine Arts and Design. This year, funds will support the School of Music in achieving the coveted “All-Steinway School” designation. For more information about this important initiative, please visit steinway.uco.edu. Contact Mitchell Hall Box Office at (405) 974-3375. Open one hour prior to show times on performance dates. Follow Mitchell Hall on Social Media!